Click2Cloud OpenShift.NET development kit enables you to run Windows nodes in Red Hat OpenShift. 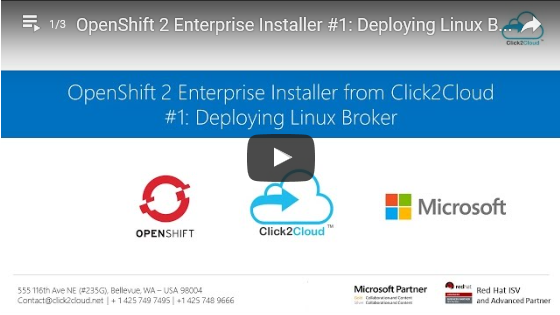 The unique solutions developed by Click2Cloud Inc. helps you deploy any version of Windows, SQL Server, .NET applications, even SharePoint on OpenShift 2. OpenShift.NET gives choice of a truly heterogeneous environment where Red Hat and Microsoft applications work harmoniously in OpenShift 2.X environment. Watch our YouTube Playlist to deploy OpenShift 2 with .NET Capabilities. 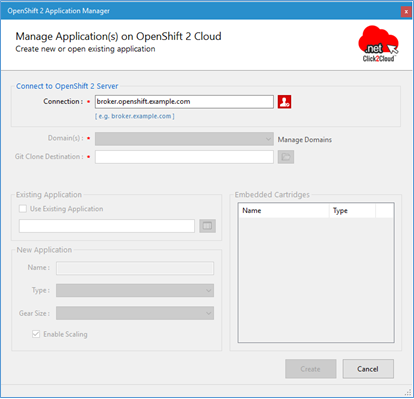 Following are software pre-requisite to install the ‘Click2Cloud Visual Studio 2012+ Extension for Red Hat OpenShift 2’ tool and manage your application on Red Hat OpenShift 2.X Cloud. The more details on Step-by-Step installation of above software pre-requisite can be found inClick2Cloud_OpenShift 2_VisualStudio_Tool_UserGuide_V1.0.pdf. You can run Windows nodes in Red Hat OpenShift and can deploy any version of Windows, SQL Server, .NET applications, SharePoint on OpenShift 2 and OpenShift Online. IT benefits from lower costs, increased agility and increased utilization in a simplified environment. Windows Servers can join Red Hat’s OpenShift 2 Platform-as-a-Service (PaaS) providing a robust, cross-platform enterprise solution. Visual Studio Tool provide developers with a seamless DevOps experience across environments increasing developer productivity, agility and velocity. With the Visual Studio Plugin developers can develop and deploy .Net applications in both your Windows and OpenShift environments. On the Click2Cloud Visual Studio Tool window, enter OpenShift serverhostname and click on Connect to Server button. 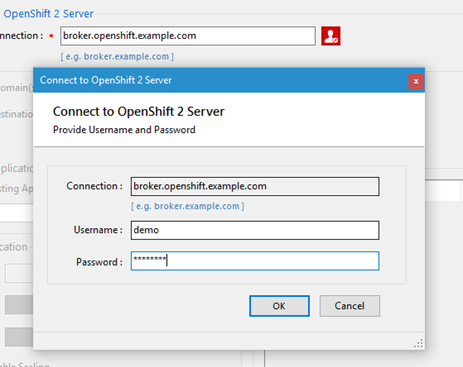 On Sign in to OpenShift window, enterUsername and Password and click OK. Phone: +1 (425) 749-7495 and +1 (425) 748-9666.